an affinity for the overblown silhouettes of the nineteenth century, achieved through bustles and crinolines. In her hands, however, the silhouettes are so radically and profoundly reconfigured as to eradicate history. 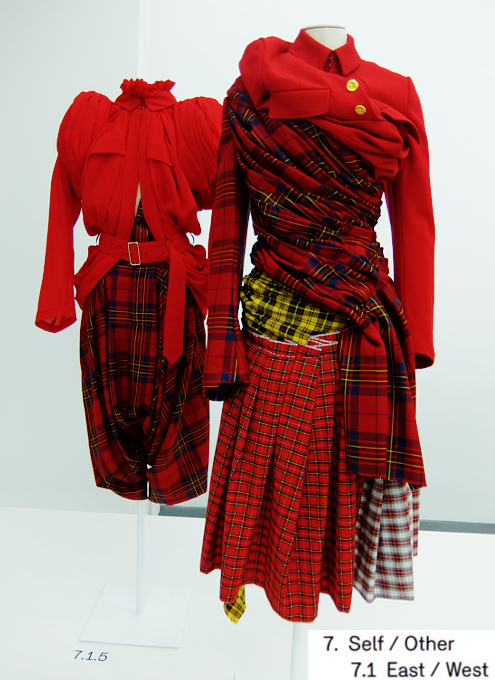 Kawakubo’s fashions impose an intense immediacy, stridently emphasizing the here and now. She brings into doubt both the logic of temporal continuity and the presumptive rhythm of life—birth, marriage, death—as seen in the Broken Bride, White Drama, and Ceremony of Separation collections. 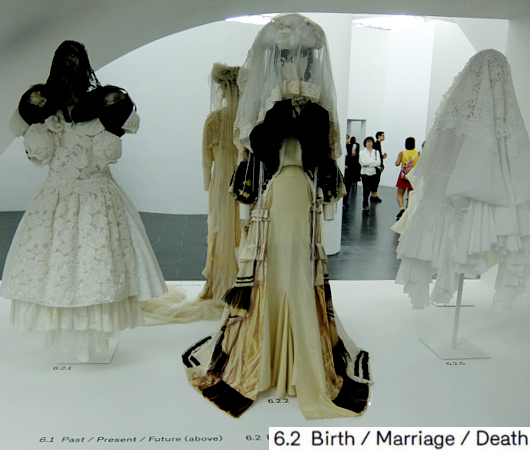 These fashions advocate a level of personal freedom that can only be attained in the intervals between a society’s life-stage traditions, thus subverting the ideologies encoded in the birthmarriage-death continuum. 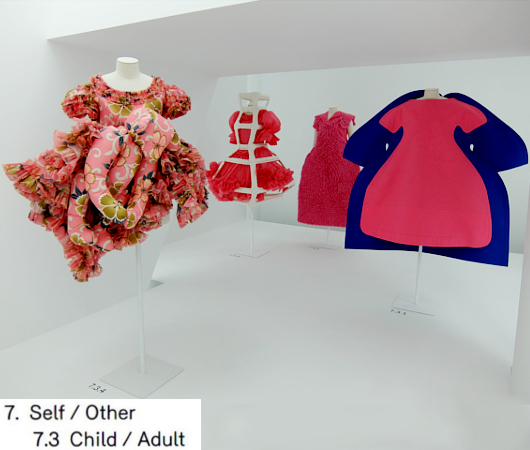 Self/Other highlights Kawakubo’s exploration of hybrid identities that blur the boundaries of conventional definitions of culture, gender, and age. 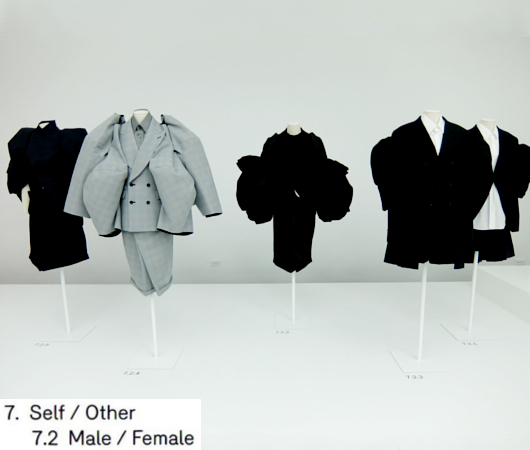 The works featured in the East/West and Male/Female subsections combine Eastern and Western and masculine and feminine clothing traditions. Historically, these are loosely defined by wrapping and draping in relation to Eastern and feminine garments and by tailoring with respect to Western and masculine garments. The fashions in Male/Female also fuse types of clothing typically associated with men and women—such as trousers and skirts—into one outfit. 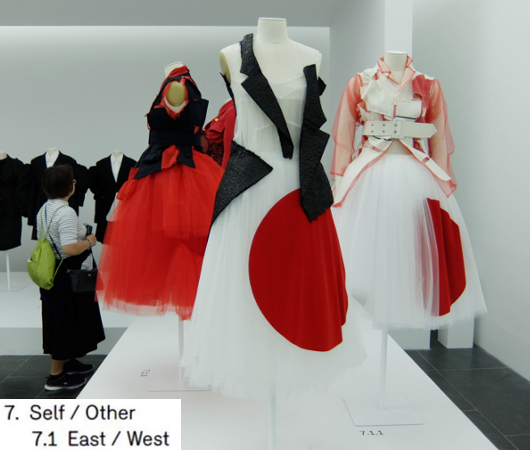 The creation of hybrid identities through fusion is further surveyed in Child/Adult, which focuses on ensembles that not only challenge the rules of age-appropriate dressing but also engage the concept of kawaii (cuteness)—a key aspect of Japanese popular culture defined by playfulness and performativity. 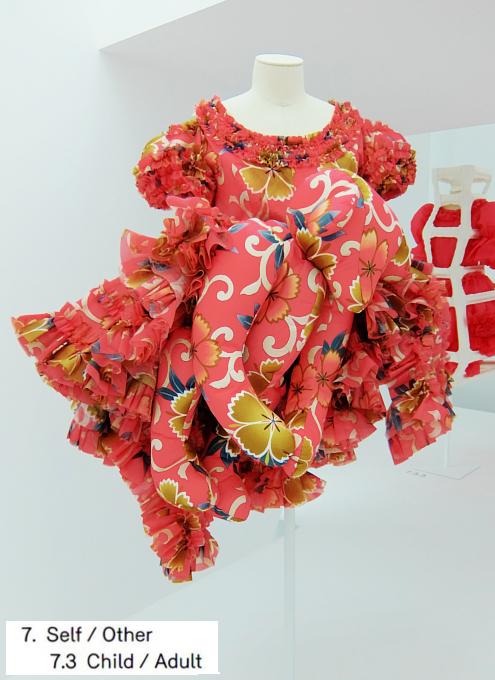 The notion of kawaii is taken to its extreme in a pink floral dress featuring an oversize stuffed teddy bear camouflaged within its frills and folds. Object/Subject considers hybrid bodies. 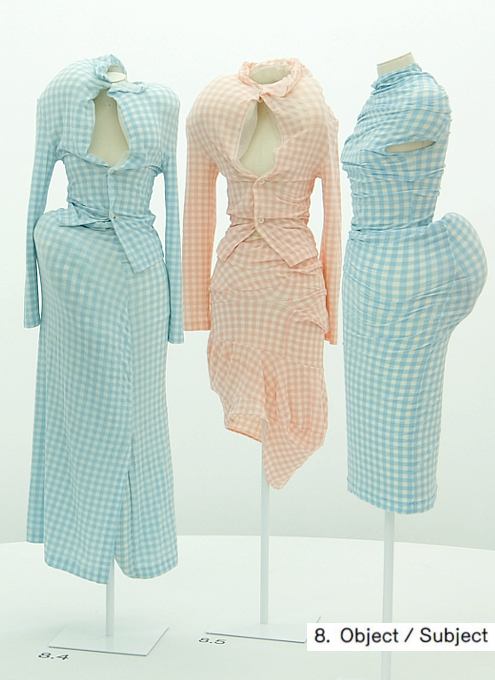 Its focus is Kawakubo’s collection Body Meets Dress—Dress Meets Body, which proposes a radical rethinking of the human form through down-padded garments of stretch nylon and polyurethane in a range of colors and patterns—including girlish bubblegum pink and powder blue gingham. Most of the paddings are arranged asymmetrically, creating bulbous swellings that present an illusion of dysmorphia and subvert the traditional language of the fashionable body (small waist, slim hips, pert bottom, flat stomach, and small, high breasts). References to tumors and hunchbacks abound in reviews of the collection, which critics christened “lumps and bumps”—a moniker that suggests a body diseased, deformed, or monstrous. 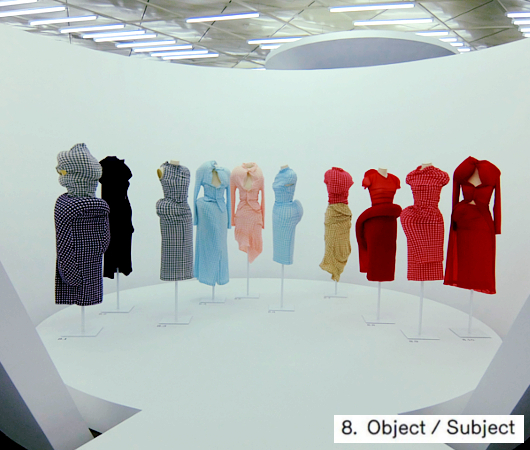 Morphologically, the collection blurs the boundaries between dress and body, object and subject. This effect is heightened in movement, a fact exploited by choreographer Merce Cunningham in the forty-minute dance Scenario, a collaboration with Kawakubo that premiered at the Brooklyn Academy of Music on October 14, 1997. 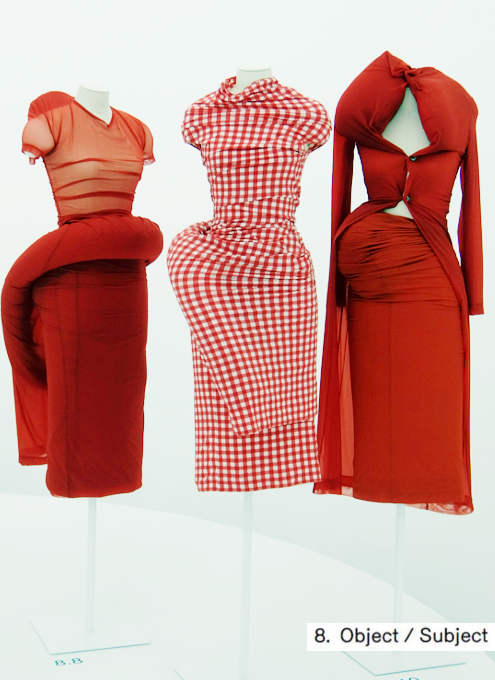 Kawakubo explained, “When the natural movements of dance are repelled and refuted, you get new forms.